This research is supported in part by the MD Anderson Cancer Center Support Grant P30 CA016672. 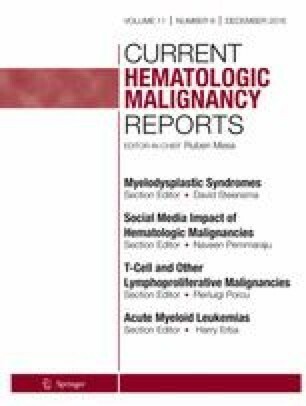 The authors thank Dr Matthew Katz and the creators of the Cancer Ontology Tag (CTO) Program for their example and inspiration, and the founders and members of Symplur.com, including Audun Utengen and the Healthcare Hashtags (@healthhashtags) Project for their continued analysis and support. Naveen Pemmaraju reports Honorarium/Consulting and/or Research & Clinical trial support: Novartis, LFB, Incyte, Stemline, Cellectis. Vikas Gupta received research grants from Novartis, Incyte, Gilead, and Promedior through his institution; served on scientific advisory board of Novartis and Incyte and received honorarium from Novartis/Incyte. Michael A. Thompson is on Advisory Boards: AIM Specialty Health, BMS, Celgene, Takeda, VIA Oncology. Andrew A. Lane reports research support, Consulting: Stemline. Thompson MA. Using social media to learn and communicate: it is not about the tweet. Am Soc Clin Oncol Educ Book. 2015;206–211. doi: 10.14694/EdBook_AM.2015.35.206. Thompson MA. Social media in clinical trials. Am Soc Clin Oncol Educ Book. 2014;e101-105. doi: 10.14694/EdBook_AM.2014.34.e101.